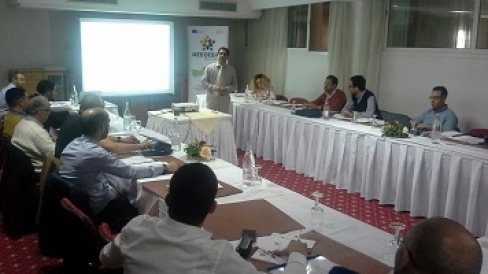 In the framework of WP5, a two days training course on solar cooling was held at Hammam Sousse (Tunisia), on April 20th and 21st, 2015. This course, ensured by Polytechnic of Milan on behalf of the Italian Ministry for the Environment, Land and Sea, was attended by 25 participants from public relevant stakeholders, SMEs, consulting firms and control office. - Two case studies were presented and discussed. The second day was dedicated to large scale solar thermal plants for industrial processes, a little exploited technology with a huge potential. The case study of a large system in Monastir was also analyzed. According to questionnaires, almost all the attendees were satisfied by the organization, topics and informational materials distributed. They agreed that the objectives of the training were reached and the personal expectations were satisfied.